With its focus on emerging concerns of kinase and GPCR-mediated antitarget effects, this vital reference for drug developers addresses one of the hot topics in drug safety now and in future. Divided into three major parts, the first section deals with novel technologies and includes the utility of adverse event reports to drug discovery, the translational aspects of preclinical safety findings, broader computational prediction of drug side-effects, and a description of the serotonergic system. 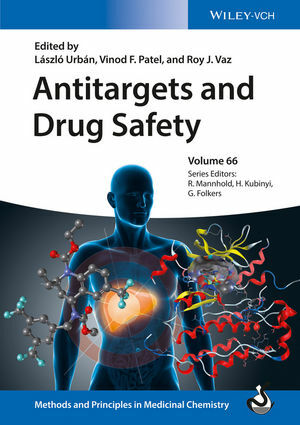 The main part of the book looks at some of the most common antitarget-mediated side effects, focusing on hepatotoxicity in drug safety, cardiovascular toxicity and signaling effects via kinase and GPCR anti-targets. In the final section, several case studies of recently developed drugs illustrate how to prevent anti-target effects and how big pharma deals with them if they occur. The more recent field of systems pharmacology has gained prominence and this is reflected in chapters dedicated to the utility in deciphering and modeling anti-targets. The final chapter is concerned with those compounds that inadvertently elicit CNS mediated adverse events, including a pragmatic description of ways to mitigate these types of safety risks. Written as a companion to the successful book on antitargets by Vaz and Klabunde, this new volume focuses on recent progress and new classes, methods and case studies that were not previously covered. Laszlo Urban received his MD and PhD in neurophysiology/neuropharmacology in Hungary, and was visiting professor at Duke University between 1987 and 1989. He is currently global head of Preclinical Safety Profiling at the Novartis Institutes for Biomedical Research, Cambridge, USA, and was previously the Deputy Head of the Novartis Institute for Medical Sciences in London, UK. Dr. Urban has over 130 scientific articles, book chapters and patents to his name. Roy J. Vaz received his PhD in organic chemistry from the University of Florida, Gainesville, an MBA from the University of Illinois, and most recently an MS in molecular biology from Lehigh University, USA. He is currently a senior distinguished scientist at Sanofi Pharmaceuticals in Waltham, MA, and was previously Director of the Investigative Product Optimization department under Aventis. He has worked at Bristol-Myers Squibb as Principal Scientist as well as at Tripos, Inc, as a research scientist. Dr. Vaz has authored or co-authored around 45 publications in peer-reviewed journals, eight book chapters and several patents. Vinod Patel gained his BSc in applied chemistry from Leicester Polytechnic, and a PhD in synthetic organic chemistry from Nottingham University, UK. He took up a post-doctoral fellowship at the University of Rochester, NY, USA, before joining Eli Lilly & Company, where he spent the next nine years as a medicinal chemist in the oncology division. He then joined Kinetix Pharmaceuticals, which was acquired by Amgen and Dr. Patel joined their new Cambridge facility as head of medicinal chemistry. In 2011, he joined Sanofi oncology research as head of medicinal chemistry where he is currently head of chemical research in lead generation candidate realization. Dr. Patel has over 50 publications and some 50 patents to his name.